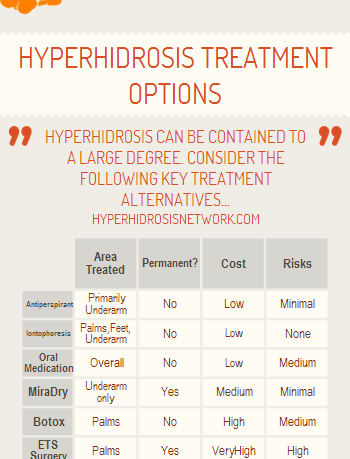 Since I was feeling especially creative today, I made up the following neat info-graphic to list and compare (at a very high level) the various popular treatment options for Hyperhidrosis! The infographic looks very useful: at first glance, it tells me that I should eliminate ETS surgery and Botox, and try to decide on some of the other hyperhidrosis treatments. Am I right?! Glad that this provoked some thoughts. I would be careful though – the table is only a very high level summary and there are several nuances that cannot be captured in this infographic – e.g. Botox may not necessarily be bad. If money is not a concern, its probably a good, semi-permanent option (the side effects may be there, but none too serious as its used for cosmetic purposes successfully). ETS, on the other hand, is something I would definitely avoid – unless the impact of Hyperhidrosis is so severe that you would consider the risks worthwhile. My advice – see a qualified medical professional and then take a call. Iontophoresis is definitely my favorite, but that just because it works for me. 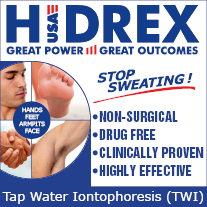 I actually have actually seen experiments where people have add a excessive armpit sweating product like Certain Dri into the injections for iontophoresis and having amazing results. I think if people were more open to new ideas that we could really find positive results that help hyperhidrosis. 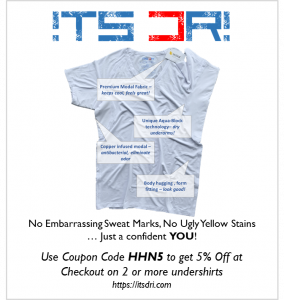 I have been using Certain Dri antiperspirant deodorant for years and I have been wanting to try this experiment that I found on Social Anxiety World. I was noticing great results when there from other people on the site when combining a process and a product together. I wonder if other people have tried this idea out? I really would like it to work because I’m already a fan of the product, I just rather not have to have to apply it all the time.